Odor from sugar gliders can be attributed to three possibilities: urine & feces, a musk odor (from male gliders), or the foods you are feeding. As far as odor from urine and feces, there are multiple options to prevent or eliminate the smell. 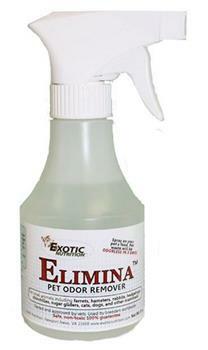 The best in our opinion is a product called Elimina Odor Remover. The active ingredient in Elimina, anthium dioxide, is an oxygenating agent, which means it enhances the exchange of oxygen at the cellular level and improves the pet's digestion. Anthium dioxide also selectively oxidizes the hydrogen sulfide and ammonia molecules in the waste. Elimina works in harmony with the pet's digestive system. This product is sprayed directly onto the food and works internally to eliminate most odors from urine and feces. It takes about 3 days to begin working but does a good job. Another way to help combat smells are to keep the cage and accessories as clean as possible. Regular cage cleanings are an important part of pet care to prevent illness and odors. We recommend spot cleaning once per day and doing a more thorough cleaning once per week. It may even be beneficial to roll your cage outside once or twice per year to spray it down with a hose, which will help get all the nooks and crannies that are hard to reach during regular cleanings. 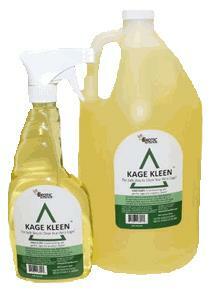 Kage Kleen works well for daily and weekly cleaning. It is a hard working yet gentle cage or cage accessory cleaner; the safe way to clean your pets cage! Spray on then wipe off, no rinsing necessary! This all-purpose pet cage cleaner is for use on all non-porous multi-surfaces. You can also try Nature's Miracle Cage Wipes that has a quilted texture, with grip dot technology or a Cage Cleaner Scrub for your powder-coated cage. During puberty, a male glider will develop scent glands (on top of his head and chest) that secrete an odor to mark his territory or his mate. In order to prevent these scent glands, the male glider must be neutered before he reaches adulthood. Otherwise, there is not a lot that can be done with odor from the scent glands. That being said, you can try to mask this odor with products such as PureAyre or Smellin' Good. Male scent gland odors can be more prevalent during the breeding seasons. See more products suggested for odor control. Will the types of foods that I feed my Sugar Glider contribute to odors? The answer to this question is yes. Higher protein foods such as live or dried insects can cause more odors in the urine, but if you are using a product such as Elimina, it doesn't matter what your gliders are eating, Elimina will remove those odors.